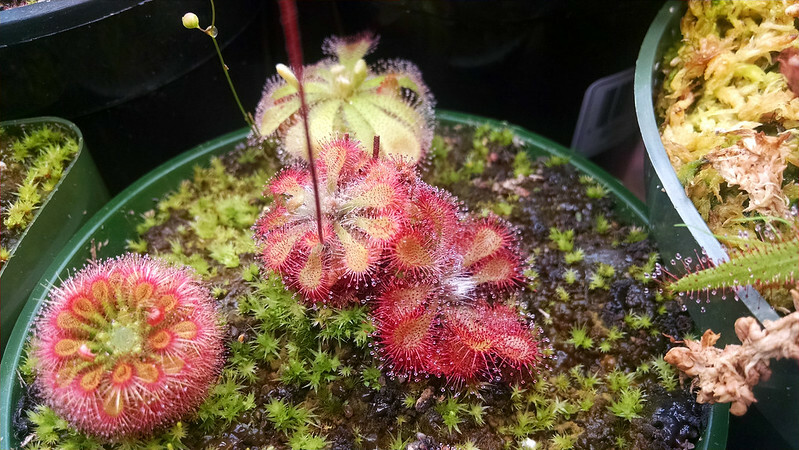 The Summer Batch: One Month update |Sundews Etc. In the spirit of updates, I decided to see what was going on with the Summer Batch. I had been pretty wary – the trays seemed to have more algae than usual, which is not what was supposed to have happened. Also, a number of the leaf cuttings had apparently withered to nothing. However, things are actually better than I'd thought! A warning though: the pictures in this post are not super exciting. First off, Drosera anglica CA x HI is striking mightily. Let's not lose these ones. Need more time to develop. Now, I've made the mistake of trying to harden off a D. anglica leaf cutting too quickly before, so it's going to be a while before I take off any of the plastic covering this tray. The fact that I'll be waiting on other cuttings to strike/develop should help reign in my enthusiasm. I actually noticed these at least a week ago, but forgot to take a picture/mention it on the blog. One of the three Drosera madagascariensis cuttings has also struck, if less dramatically. It's always exciting seeing a new strike on a leaf cutting, seriously. The other two aren't looking so hot, but at least I'll have one more plant started! The Drosera adelae cuttings basically withered and dissolved almost immediately, which surprised and disappointed me. However, just today I noticed action on one of them. Guess I don't really understand D. adelae! Little plantlets sprouting from the mucky old leaf. I know soon enough I'll be laughing at myself for deliberately cultivating this famously prolific sundew, but for now I'd really like some more plants. 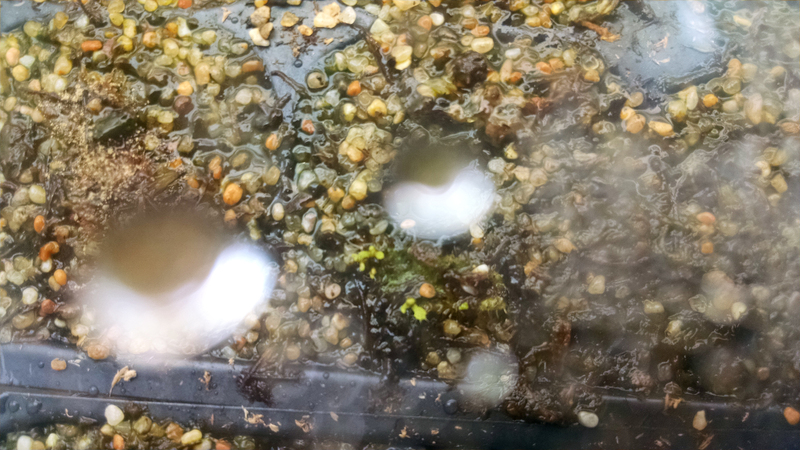 I've also noticed sprouts for 2 of my seed-started plants, Drosera tokaiensis and Drosera capillaris. 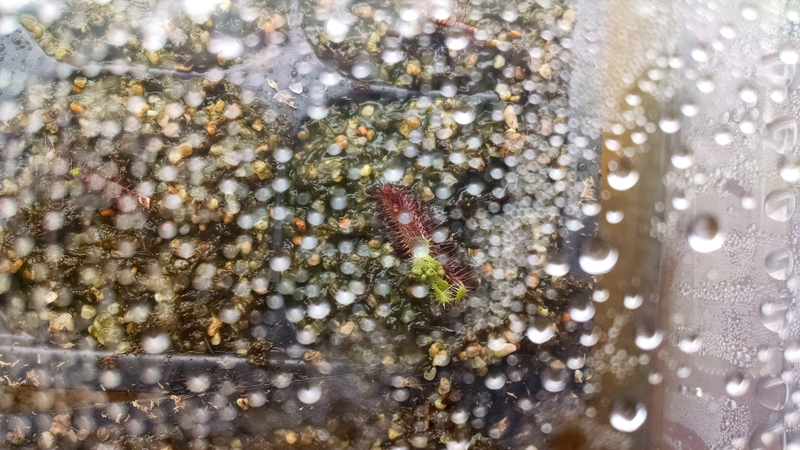 Drosera seedlings are really hard to see, hahahah. The D. tokaiensis seedling is right in the middle of the photo, and in fact I saw sprouts in all 3 cells in which it was sown. This was something of a test germination to make sure my plant was actually viable, and it sure is! Also, if you look closely at the cell in the top left of this photo there is a tiny D. capillaris sprout, one that I didn't actually see when I took the picture! When I was preparing for this post in Photoshop I saw the green speck, and then ran downstairs to confirm. 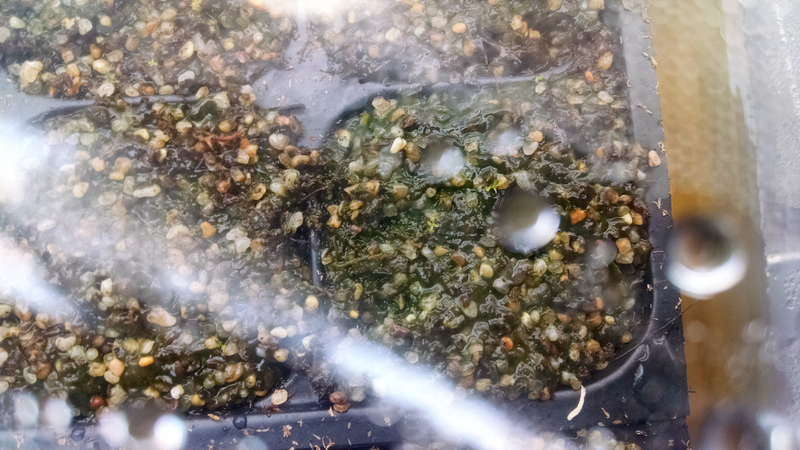 Yes, in fact a number of the D. capillaris seeds have sprouted. This is exciting, since it means they apparently don't need cold stratification to sprout quickly, at least when the seeds are fresh. I didn't bother taking another photo because they look identical to the D. tokaiensis seedlings, but I'll get some more in the future. I've definitely had some surprises with this round of propagation! I had expected to see D. adelae strike before D. anglica and to see Drosera venusta before D. madagascariensis, and was wrong on both counts. 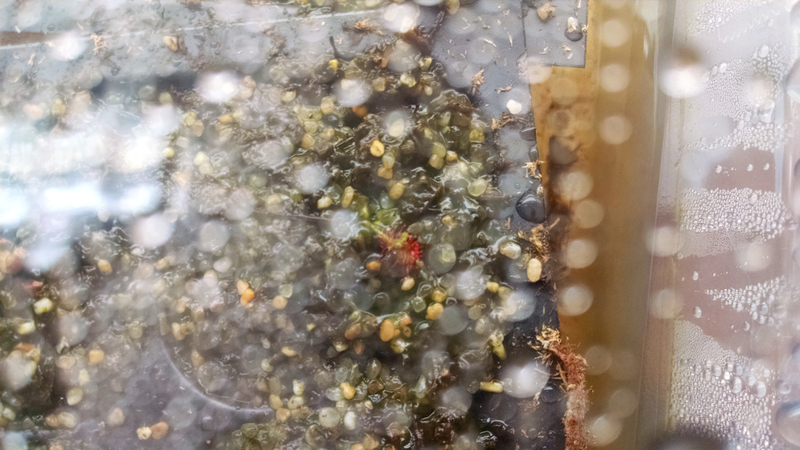 Also, I was sure that the extremely fresh Drosera intermedia 'Cuba' and extremely weedy Drosera burmannii would germinate before D. capillaris and D. tokaiensis. Funny about that. I'll leave you with a picture of my mature D. tokaiensis in its mixed pot, since the pictures this time around were sort of uninspiring. D. tokaiensis and buddies in the mixed pot. 8-4-14 Drosera anglica CA x HI, struck. Date approximate. 8-11-14 Drosera capillaris Alabama, germinated.